The aim of Feng Shui is the most simple of all: sleep better, live better, work better. Lack of sleep weakens the immune system as well as the ability to concentrate during daytime and makes us more prone to depression, anxiety and low mood. We spend a third of our lifetime sleeping, so it stands to reason we should do everything possible to ensure a restful sleep. The following tips will encourage a better night’s sleep so that you feel energised and positive at the start of each new day. Your bedroom should be a sanctuary. 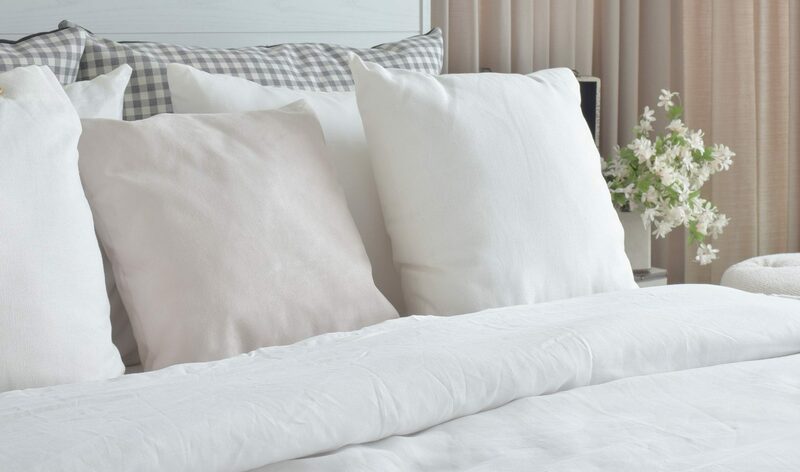 Keep it devoid of clutter, open the windows at least ten minutes each day to allow fresh air to flow through, and regularly change the bedding – preferably in cotton or washed linen – to keep it crisp, fresh and inviting. Opt for soft lighting and try not to have screens in the room (TVs, tablets, laptops and phones) as using these before bedtime makes it difficult to sleep. Before going to bed, you can burn 2 or 3 drops of Ylang Ylang Essential Oil in a diffuser; it will promote relaxation and a restorative sleep. One of the most common factors of sleep deprivation is worry. It is important to clear your mind of negative thoughts before you go to bed. There are a number of ways to do this, such as writing down what’s on your mind or compiling a to-do list for the next day; you can also express gratitude by thinking of three good things that happened to you during the day, which is a great way to banish negative thoughts and go to bed with a positive frame of mind. You may have heard that you should sleep with your head positioned toward the north. Actually, the direction you should sleep is determined by your ming gua based on your date of birth, but even though you don’t know your ming gua, you can find the ideal position for your bed: it should be placed on an unobstructed wall, diagonally across from the door and far enough away from the window so that the flow of Qi does not disrupt your sleep. The bed should also be accessible from both sides, but for a single bed such as a child’s one, it can be placed against the wall. Placing your bed under a window does not promote quality sleep: as Qi flows into your bedroom from the door to the window, you would then sleep in the middle of a “wind tunnel” that causes disturbance. For the same reason, you should avoid placing your bed between the door and the window. As feeling secure is a Feng Shui basic for a good sleep, your bed should be supported by a wall and therefore not placed on an angle or in the middle of the room, without any solid support. Finally, you should avoid sleeping under ceiling beams because of the sensation of danger they create. There is no specific colour to use or avoid in a bedroom; it most depends on your taste regarding interior design and overall on the Feng Shui evaluation of your bedroom that would give guidelines on which of the five elements (water / wood / fire / earth / metal) to display and the corresponding colour scheme. And remember, shiny colours are proven to make you feel more positive and happy so add splashes of colour to brighten up your mornings! What if you’re still not sleeping well? If you’ve done everything you could and applied every piece of advice above to improve your bedroom environment, but that you are still facing sleep problems, then a Feng Shui evaluation of your bedroom might be a good option. Once you will have made the changes recommended, in just a few days, according to my experience, you will start sleeping peacefully and restfully again, so it’s really worth a try!